More "fire agate" ..... 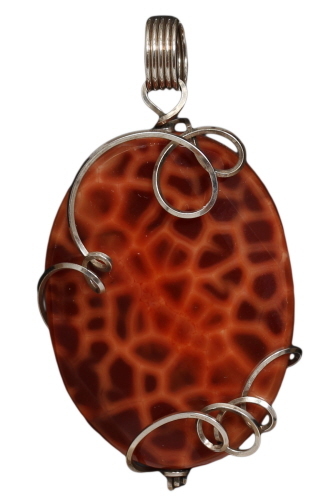 This bead is deep burnt umber in color, cut into an oval shape and faceted to catch the light when moved, causing reflections across the stone, reminds me of the rays of the sun. Larger in size, measures 40 mm x 30 mm. Wrapped in sterling silver wire. Finished size is 57 mm x 31 mm. Weight is 0.7 oz.